GOOD EVENING CITIZENS OF METRO PRIME! Do you like how I threw that quote up there to make it seem like The Feeble Files is utterly fundamental? Like, “I don’t know this quote, I must’ve missed some sort of pop culture phenomenon!”? You didn’t. It’s not. I’m fairly confident only two people have ever played this game, one was me on the PC back in 1997, the other was me on my laptop, after buying a copy from GOG in 2013. To say this is something of a cult game is an understatement. And it’s flawed. Flawed like a chocolate fireguard. But nobody ever points out that chocolate fireguards, in spite of being pointless, are delicious. And you had to know what you were getting into when you made the purchase of said confection. You play as Citizen Feeble, an alien thrust into a world of government betrayal and general George Orwell-isms in spite of being, well, feeble. Subtle character naming for the win! You start out as a good Citizen, living in perpetual fear/love of the all powerful Omnicorp. Shenanigans occur thanks to a group of freedom fighters, leading to Feeble being sent to the clink on the most trivial of charges. 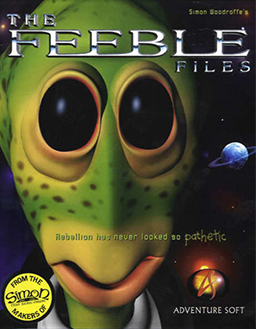 From there, The Feeble Files becomes a story of an underdog fighting to free the galaxy from oppression. The story doesn’t reinvent the wheel, but it’s a very solid, warm and humorous wheel. Point-n-click, wooooooo! You’re unlikely to find anybody getting giddier over a point-n-click game than us. It’s partly a love of storytelling intertwined with (sometimes frustratingly obtuse) puzzles, and partly because, for a very long time, point-n-click games were the only gaming genre that was actually, well, funny. No arguments here regarding Feeble. 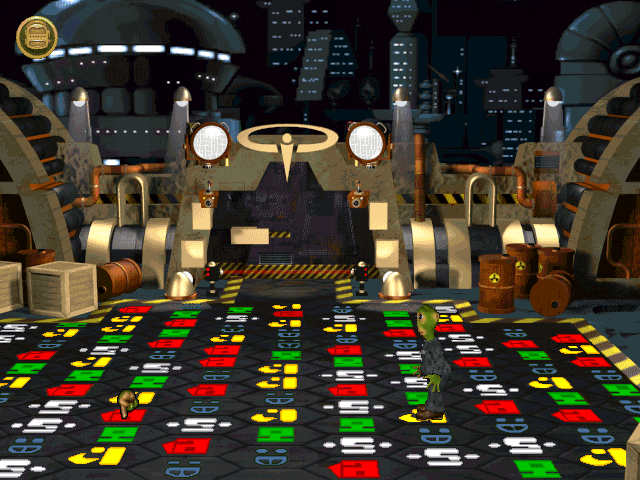 In spite of it’s otherworldly setting, Feeble is quite possibly one of the most British games ever produced. You can walk up to the bar and ask if they have any crisps. At one point Feeble laments his lack of milky tea. Feeble is voiced by Kryten for heavens sake! The general nervous apathy towards even the mildest of scenarios from Feeble echoes pretty much anybody you’d meet on a morning commute in Bognor Regis. So, those puzzles then. Right. Here’s where things get dicey – there are puzzles that make perfect sense, and will all come to you in a flash providing you’ve been paying attention. There are maddeningly difficult puzzles, such as a brief dabble in chemistry, which eventually do make sense, but not until you’ve worn your mouse hand down to a bloody nub. And then, there are puzzles which are literally unsolvable. I’m not kidding. There’s a mini game called ‘Swamp Stew’ on an old Simon The Sorcerer (yes!) arcade machine that is, in every sense of the word, unsolvable. Fortunately it’s not vital to progressing in the game, but it proves a huge stumbling block, and is just fairly shoddy work in all honesty! A major frustration is the travel in the game. Find where you want to go. Click. Then wait 3 hours for Feeble to WADDLE HIS DUMPY ARSE OVER THERE! I may be over-exaggerating, but it’s a real thorn in your brains side when you FINALLY figure out that puzzle, only to have to wait for what feels like an eternity to get back to where you need to solve it. In spite of these, admittedly major, flaws, the puzzle solving when possible is immensely satisfying, and the game exudes so much humour and charm that it’s impossible to stay mad at it. For a game released in 1997, it holds up well. The environments are well rendered, and often stunning, which offsets the pixely cut-scenes and general lack of character animations. The voice acting is brilliant, and not enough good things can ever be said about SAM the robot. Pros: Funny. Really funny. Like, actual comedy. Great characters, Great locations, SAM the Robot, KRYTEN! ‹ Sensible Soccer: European Champions. Sensible Software (1992). Sega Genesis. Just wanna say that you are not alone. I play The feeble Files, a milion times alredy and I never get tired of this beautiful game. I play it on my very old windows 98 pc, I modify (one at the time) every single files of the 3 cd (1.553 files) to make it work on vista, I even bought a version in English (I’m Italian and yes now I have 2 copy of the game) and still not tired of it. Is it a cult? of course, is it know? maybe not but still I think that TFF is a black pearl in a sea of white boring ones. P.S. sorry for any grammar error.